Union members picketed outside the Westin Copley Monday evening as part of a rally staged by Unite Here Local 26. Hundreds of workers from area Marriott hotels and their supporters rallied in front of the Westin Copley on Monday, banging homemade drums and carrying signs, to demand a fair contract. The union representing the employees said that it had set a Sept. 12 vote on whether to authorize a strike. During the protest, police shut down Huntington Avenue for about 10 minutes when about 20 people sat down on the street around 6:15 p.m. The majority of the protesters were members of the Unite Here Local 26, which represents hotel and food service employees around the city. The union is seeking to protect its workers as the industry undergoes major changes, including new technology that will automate many hotel tasks. Police said there were no arrests during the rally. Brian Lang, president of Local 26, said the union has been in contract negotiations since March. He said its members plan to stay in the streets until a contract is reached. The protest, he said in an interview, is only the beginning. Marriott is the largest hotel operator in Boston. Toula Savvidis, who has worked as a bartender at the Sheraton Boston for 18 years, said she struggles to keep up even as an established employee. She plans to retire in the next 10 years, but she’s concerned about the future. A spokesman from Marriott International said in a statement Monday night that the company respects employees’ right to voice their opinions. “Marriott International has longstanding and productive relationships with Unite Here and is negotiating in good faith and in a timely fashion to obtain the best outcomes for our associates and guests,” the statement said. On Monday evening, Local 26 protesters were joined by another coalition of marchers led by SEIU 32BJ, which planned its march in a show of solidarity.The union represents property maintenance workers, doormen, security officers, window cleaners, and school and food service workers. Several representatives of nurses and higher education workers joined the march as well. By 6:30 p.m., most of the protesters began flooding Huntington and started to march toward the Prudential Center. Police followed the crowd and blocked off traffic. The group then marched past several hotels, some of them Marriott-owned, as it made its way down to the Christian Science Plaza. 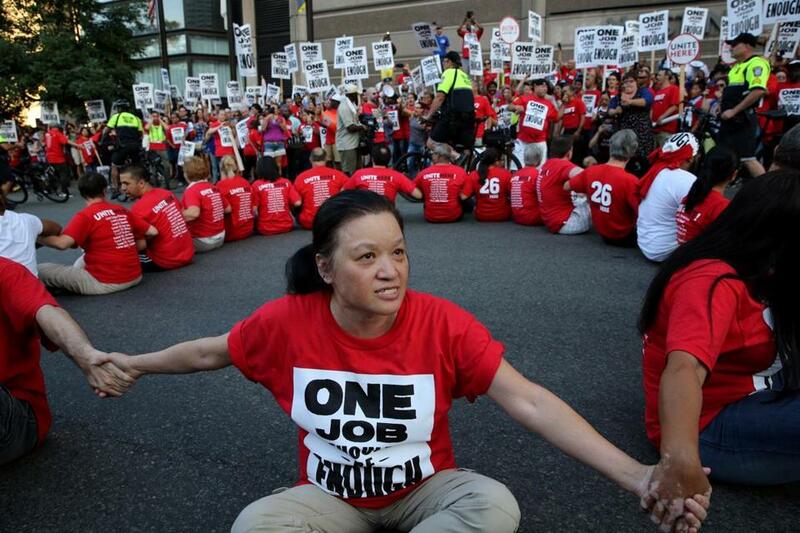 They finally stopped in front of the Sheraton Boston, where organizers announced the strike-authorization vote.